Stroh rum is popular in the world, but in Russia know him only connoisseurs and travelers. The correct name of this drink "shtro", it is a very strong rum, flavored with spices and herbs. It is believed that rum Stroh began to publish in 1832, the Austrian Sebastian Shtro. On the territory of the Austro-Hungarian Empire, where lived Mr. Shtro, it was not possible to buy spicy ingredients that were extracted in the overseas colonies with a tropical climate. Austria did not have colonies, then Shtro began to experiment with the different available spices and food dyes, which he dissolved in alcohol-based, so trying to get the aroma of tropical sugarcane. This experiment was a success, and Mr. Shtro became the only manufacturer of Austrian Roma. Subsequently beverage production began to apply the available sugar cane waste. The technology of rum making is quite simple, the wort is prepared from sweet cane and aged in oak barrels for at least three years. Of course, manufacturers have secrets that are not available to a wide range, but then, they are secrets that are kept in strict confidence. This Austrian rum is so strong that in its pure form to drink it few. For a hundred and eighty years of production Shtro rum began to be produced in three types with different contents of alcohol. It can be drinks with 80, 60 and 40 degree alcohol content. Usually this drink used for cocktails. In everyday life rum Shtro used in pastry, added the rum to the dough and the filling. He is part of hot drinks such as grog and punch. Tourists visiting Austria, be sure to buy a souvenir in the form of a bottle of Austrian rum, which is produced under the brand "hunter's tea" and that really added to strong black tea. 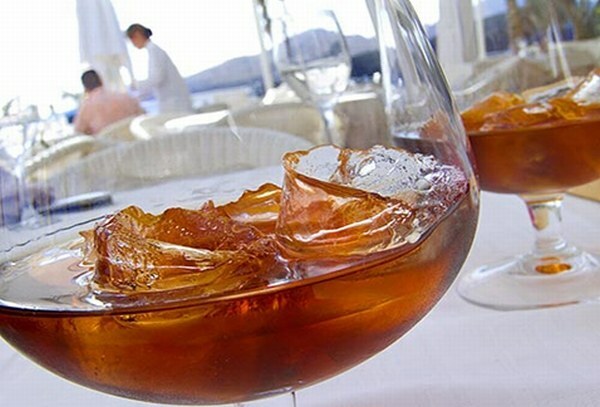 The most common cocktail with the use of Austrian Roma consists of three parts rum, two parts of schnapps, one part red wine. All is shaken up in a shaker, poured into glasses and consumed instantly, as this cocktail is very strong and does not imply that it savoring. Cocktail B-52, which, however, the Austrian rum is rare, is popular among visitors of night clubs. Part of the classic cocktail consists of three liqueur: coffee, plum, orange. The method of preparation is as follows: coffee liqueur poured onto the special stack bottom, the tube, pour in no more than 20 ml of rum, top with equal portion of plum liqueur and then the orange. These liquors contrasting color, and this cocktail looks very attractive. Particularly successful cocktail uses when it is ignited. In fact, it got its name because of the American strategic bomber b-52 that dropped the bomb. The effect of the cocktail is similar.